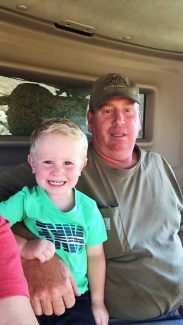 James Wilke loved to farm in his John Deere tractor with his grandson Breckin in the buddy seat. James Wilke was the epitome of a kind, giving, Godly person, so much so that he left this earth in an effort to help his fellow man. The 50-year-old farmer from Columbus, Neb., about 90 miles west of Omaha, answered a call March 14 to rescue a motorist stranded in swelling floodwaters in Platte County, Nebraska. It would be the last time he climbed into his John Deere tractor, something he had done hundreds or perhaps thousands of times before, often with his grandson Breckin, who turned 4 just days after his papa's death. As he was crossing an overflow bridge along Monastery Road, guided by emergency responders, the structure gave way and his tractor plummeted into the water. James' body was recovered on a creek bed downstream, near his home. It was a way, family said, that James could say he is home, family friend Jodi L. Hefti wrote on Facebook Friday (March 15). "Not all heroes wear capes or uniforms," she wrote. "I know a true hero who wore a T-shirt, blue jeans, work boots, and drove a John Deere tractor." James' family laid him to rest Tuesday, and the basement of Christ Lutheran Church, where a TV was set up for overflow, was standing room only, a great testament to the kind of person James was, said his cousin Paul Wilke. James was an elder at the rural church. James' and Paul's dads, brothers, farmed together their entire lives, Paul said. They lived only a mile apart and shared equipment and labor. Paul and James stepped into their fathers' roles and farmed in a similarly close fashion. Paul will step in to help James' only son Colton in much the same way in the coming days, weeks and months. Colton, 23, will step into his dad's boots. "We're going to help him out, and a lot of the neighbors will too," Paul said. "The cattle needed to be taken care of right away, and a lot of people pitched in. He loves to farm, he's been farming since he was old enough to sit in the tractor with his dad." Colton has been taking the loss of his father the hardest of any family member, Paul said, but the loss of their dad is far from easy on his daughters, Julianne and Abbie. Rachel, James' amazingly strong wife, Paul said, is leaning on her tremendous faith during this trial in her life. James was very involved in his community, including being a member of the Bismark Township Board, Nebraska Cattlemen and Platte Valley Cattleman. He was on several committees at Lakeview High School, and active in the FFA alumni. "James was everybody's friend. He was concerned about other people and very close to the friends and his family that meant the most to him," Paul said. "He was very involved in the church and in the community. He didn't just talk about things that needed to be better, he made stuff better." The Wilke's cattle were spared in the flooding due to their high vantage point, and the water levels went down just as quickly as they rose, but the damage that is left behind is astounding, Paul said. While Paul lives only a mile from James' house, he has to take an eight-mile route to get there due to the damage done in between. Many of their neighbors suffered loss of livestock. The family is grateful that their husband, dad, grandfather, and cousin is being remembered for the grand and loving person James was.